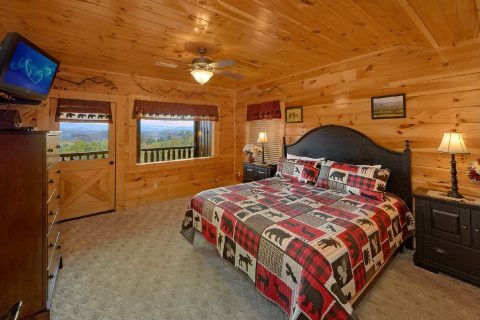 Looking for a cabin in Sevierville that sleeps up to 16 guests in comfort? 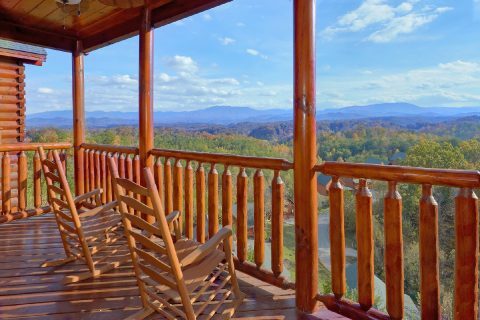 Check out "Majestic View," a lovely cabin in Grand View Resort in Sevierville that boasts mountain views and plenty of comfortable sleeping space for your group! 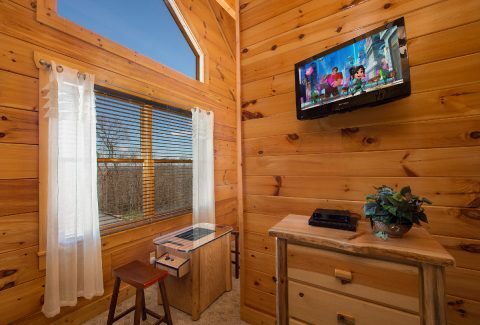 Thanks to this cabin's great location in Grand View Resort, guests of this cabin will enjoy resort swimming pool access and access to discount tickets for Wahoo Ziplines. 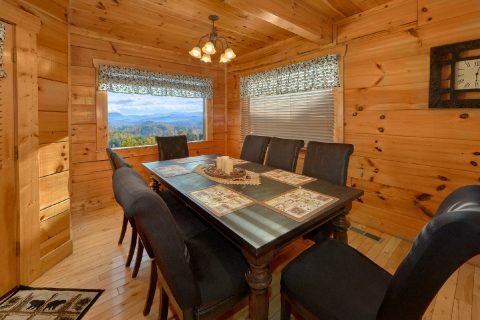 Better yet, this cabin with a great view also keeps you close to the attractions, restaurants, and shops of the Pigeon Forge Parkway. 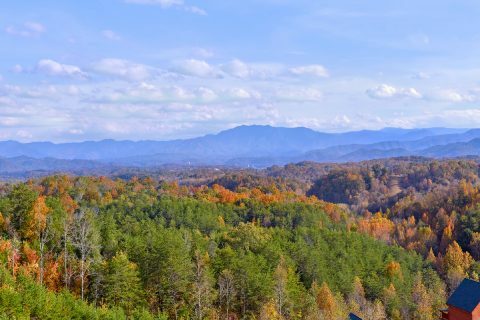 Other destinations like The Great Smoky Mountains National Park and charming Downtown Gatlinburg, TN are also only a short drive away. 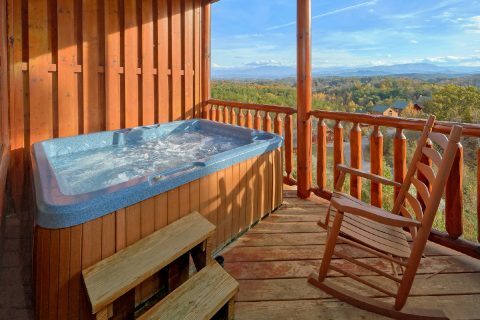 After a great day spent exploring the Smokies, you can look forward to kicking back at this luxurious resort cabin. 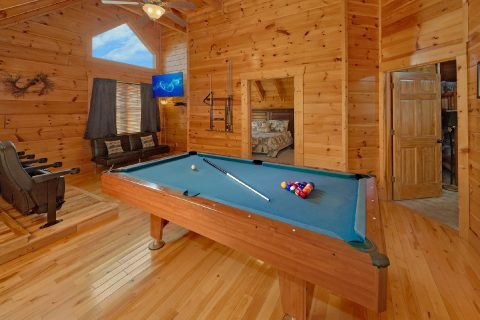 On the main level, you'll find a nice living area complete with an electric fireplace and a large TV. 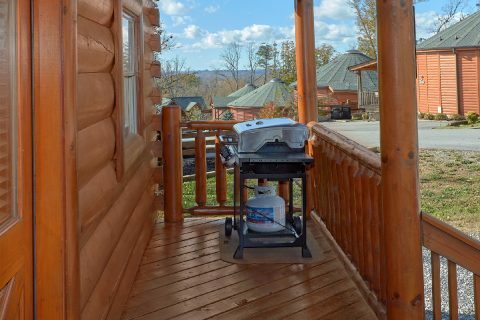 From here, you can step outside onto your cabin's deck that boasts a nice view. 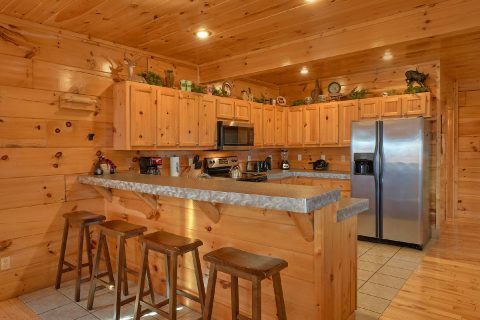 This level is also home to your cabin's kitchen and dining area, where you can enjoy a home-cooked meal with family and friends. 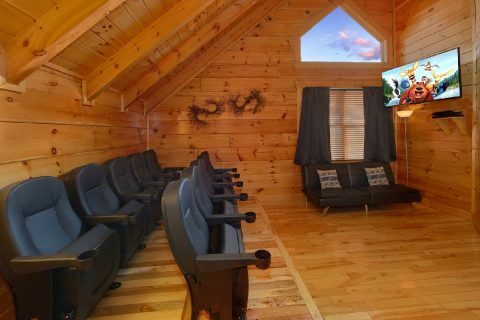 For some in-cabin entertainment, your cabin offers an upstairs game room area complete with a pool table and theater area with a large television and real theater-style seats! 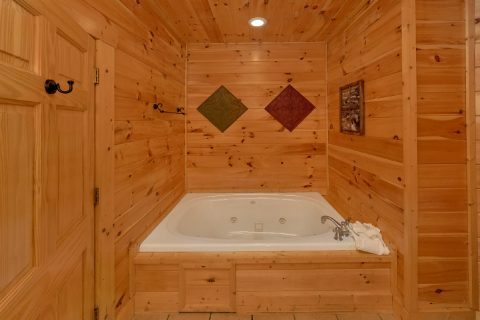 On your cabin's lower deck, you can always take a soothing dip in the warm waters of your cabin's hot tub. 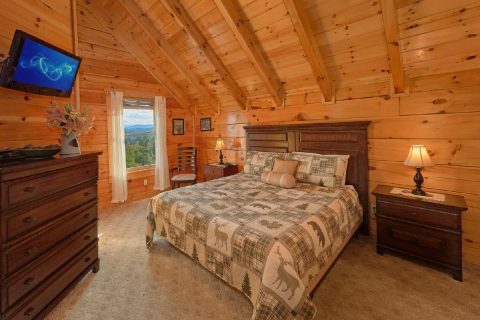 Once you're ready to get some rest before your next day's adventure in the Smokies, you can look forward to sleeping in one of this cabin's comfortable bedrooms. 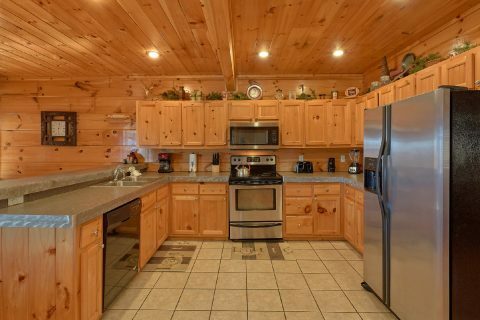 The upper floor of this rental is home to 2 bedrooms. 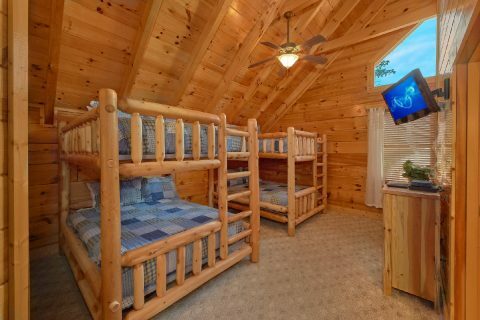 One bedroom houses 2 sets of queen bunk beds, a TV, and a private bath with a jacuzzi tub. 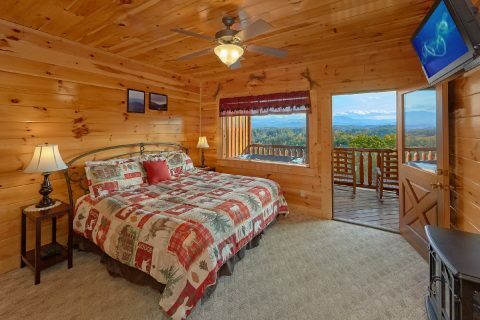 The other bedroom provides a king bed, private bath, a television, and a nice mountain view. 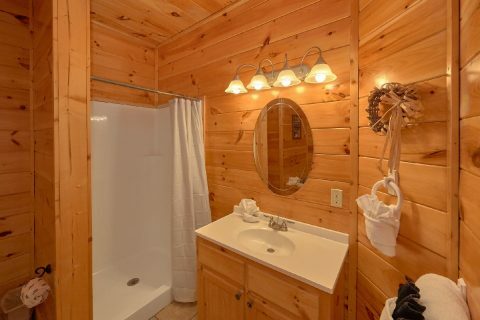 On the lower level of your cabin, you'll find two more king bedrooms with full bathrooms, televisions, and nice mountain views. 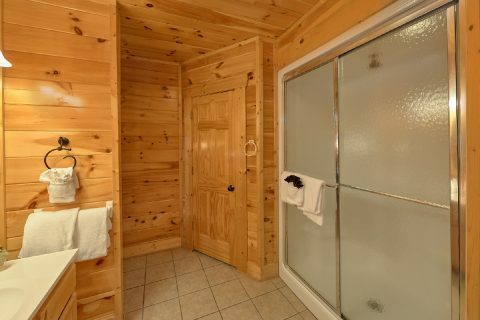 One of these rooms even provides an electric fireplace. 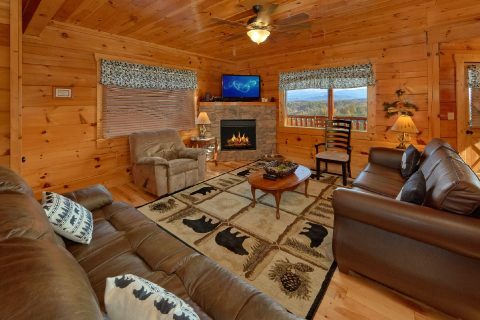 Lastly, the main floor living room offers a sleeper sofa for extra guests. 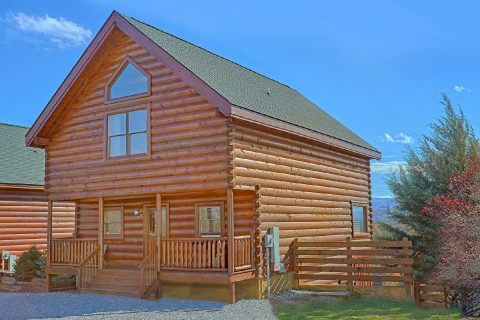 Lastly, this luxurious cabin also features useful amenities like a gas grill, a washer & dryer, wireless Internet, and ample parking for up to 6 vehicles using the main parking area and a small gravel area. Book "Majestic View" today with Cabins USA Gatlinburg to earn a special 15% cabin discount on your nightly rate in the Smokies!